Exotic destinations are plentiful in Asia, and if you wish to visit where you will have a keen sense of history, and also observe a glimpse of the glorious and mystique eras of the past, nothing can be more exciting and informative than going on Ayutthaya tours to sightseeing the notable ruins of a great kingdom. Set at the conjunction of the Lopburi, Pasak and Chao Phraya Rivers, the beautiful ancient city of Ayutthaya, was founded in 1350 by King U-Thong and was Thailand’s capital for 417 years, of what was then known as Siam. The most important place to visit on Ayutthaya tours is the Buddha Head at Wat Mahatat. The Buddha Head wat or temple has a most intriguing facet of nature inter-vowing with the partial statue of the Enlightened One – The Buddha. 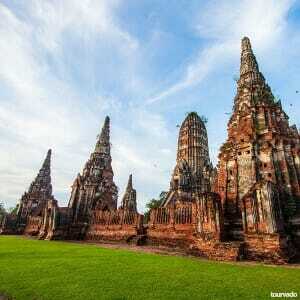 Below discover the best tours in Ayutthaya Thailand. Here you can see many headless Buddha statues and one particular shrine where there is the famous Boddhis tree, with roots seeking to spread over a wall of slate, and mostly exposed yet firmly entrenched, as if telling us a story of peace and stability against a world of uncertainties. Also on Ayutthaya tours you should visit Chao Sam Phraya National Museum. It is one of the most modern buildings in Ayutthaya; Chao Sam Phraya National Museum was founded by King Bhumibol Adulyadej in 1961. It houses a number of sculptures and works from different periods throughout Thailand's early history. Two highlights are a seated Buddha and a huge bust of the Buddha in the U Thong style. From here, you can head to Bang Pa-in Palace. Also known as the Summer Palace, this royal residence is one of the best-preserved compounds in the area. The buildings feature several architectural styles, including traditional Thai and Chinese structures, and there's also Phra Thinang Utthayan Phumisathian - a two-story Victorian style mansion. Another interesting spot is Ho Witthunthassana, the three-story, tower-style building used for scoping out the countryside and watching for royal elephants. It is a great sight to behold on Ayutthaya tours. All these locations are a must to visit on Ayutthaya tours to get the best out of your holiday.